Happy St. Patrick’s Day! Enjoy the “holiday season”, but please don’t be a plastic paddy. Show some respect for the saint (and yourself). 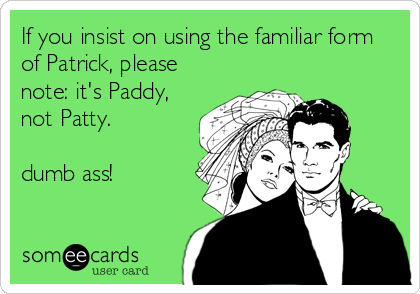 If you insist on using the familiar form of Patrick, please note, it’s Paddy, not Patty. (Patty is short for Patricia). But is it so hard to say Patrick? It’s the same amount of syllables! Wearing a t-shirt with an offensive Irish stereotype says more about YOU than it does about the Irish. Drinking green beer is just ridiculous. Harmless, sure. But no self-respecting Irishman would drink that shite. If you are drunk before noon, you are doing it wrong! Have a safe one, don’t drink & drive.